In June 2011, the Horniman Museum offered to loan a genuine Japanese monkey-fish to the museum of the Royal College of Physicians (RCP). The RCP said ‘yes’, of course, because who wouldn’t want a genuine Japanese monkey-fish? The monkey-fish was not due to arrive until December, but the word of his coming spread through the corridors of the RCP like wildfire. What was monkey-fish? Who was monkey-fish? ‘It’s the missing link,’ said some, while others speculated about a chupacabra roaming 11 St Andrews Place after dark. An urban legend was born. I work at the RCP and it is likely that I played a small part in the creation of the RCP’s very own cryptid. So while the bees are on their winter break, here is a post about another species, or two, sort of. The RCP held two lunchtime talks on Tuesday 20 December with experts from the Horniman Museum and Wellcome Library on the subject of ‘Fakes, forgeries and quacks’, inspired by the loan of the Horniman monkey-fish. Japanese monkey-fish, or mermen, were popular attractions during the 19th century and were touted as being real creatures. The second talk, ‘Making mermaids: a fishy business’ by Paolo Viscardi, curator at the Horniman Museum and Garden, traced the chequered past of monkey-fish revealing the history of mermaids, tales of fraud, media manipulation and shipwrecks. Among the audience were a number of RCP staff who were eager to find out more about monkey-fish, or ‘Alan’ as he is affectionately called. Paolo took us on a journey of mermaid sightings from the Sirenia, or sea cows, mistaken for mer-folk by ancient mariners, to the thousand-year-old shrivelled ‘mermaids’ of Japanese Shinto shrines, to the famous Fiji Mermaid exhibited by master showman PT Barnum in the 1840s. This was all very well, but what I wanted to know was this: who is our monkey-fish? On Tuesday, 2 September 1919, a Japanese merman was purchased by, or on behalf of, Henry Wellcome at an auction held by Stevens London auctioneers. The auction catalogue listed the specimen as ‘Japan, Mermaid, paper-mache body, with fish-tail 20 in. long x 9 in. high’. [ref] The merman came to the Horniman Museum from the Wellcome Collection in 1982, and somewhere along the way it gained the name ‘monkey-fish’ because of its appearance of a monkey’s head and torso sewn onto the body of a fish. Mystery solved, or is it? As if that were not enough excitement for one afternoon, we were told that there could be 100s of monkey-fish out there, waiting to be found. There might also be monkey-fish babies, which led to a twittering of ‘I want’ tweets. The Horniman monkey-fish even has a sibling on display elsewhere in the UK – a dark twin called Paul. I may have made up that last bit. Come and see our monkey-fish! The monkey-fish will be exhibited alongside items from the RCP’s own collections, which involve an element of fakery – whether intentional or not – until 20 January 2012, and is open Monday–Friday, 9am–5pm. No booking is required and entry is free. The exhibition area is closed on public holidays and for RCP ceremonies. The RCP museum holds various events all year round and information on how to visit is here. Monkey-fish will return home to the Horniman Museum at the end of January, which also looks like a pretty interesting place to visit. 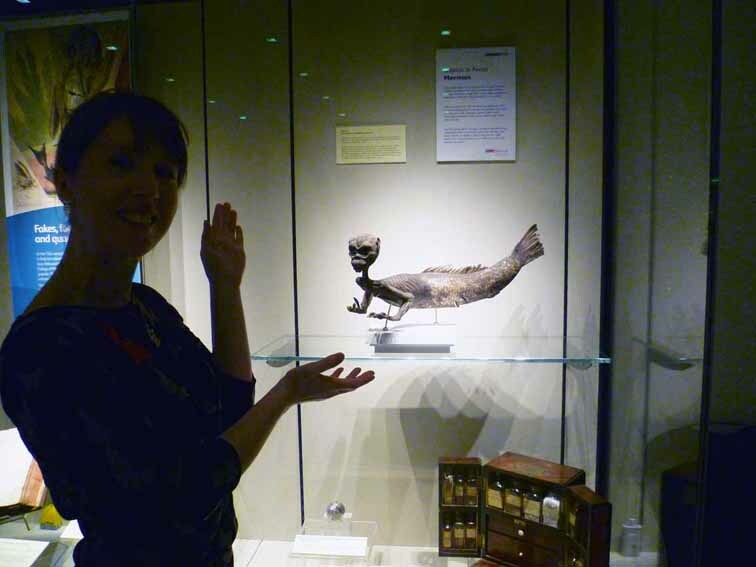 This entry was posted in Myths and legends and tagged Horniman Museum, Japanese, mermaids, merman, mermen, monkey fish, RCP, Royal College of Physicians, Wellcome Library by Emma Maund. Bookmark the permalink. ‘What is a monkey-fish made of? Paper, wood, string and clay, with fish bits and chicken feet!’ said Paolo. ‘But no monkey.’ – Brilliant! Thank you Emily, that was my favourite bit too! I will miss monkey-fish when he goes, very nice of Paolo to give me images for this post. We were originally conjoined, but I gnawed through the mess of reconstituted chicken feet tying us together, constructed a boat from a discarded bible (my Japanese origami skills serve me well) and set sail from shore to shore wreaking havoc & mayhem and bringing wonder & awe. Not for me the confines of a glass case, smeared with the snotty noses of gasping tourists and gawping toddlers. One day twins will reunite. Babies shall gather with their ‘monkey’ teeth gnashing and their fish tails thwacking on marble stairs. And, finally, we shall rule. A prosperous new year to you also, Paul. But remember: monkey-fish shall never kill monkey-fish. What an interesting story. I’ve heard of the Horniman Museum before and now think it is definitely worth a visit. Have to feel sorry for the bits of fish and chicken used to make this strange creature. Where did the feet come from I wonder? Feel sorry only for the fish-and-chicken bits used to make Paul. I think this is my favourite comment! 🙂 You may be right. I don’t think monkey-fish liked being gawped by tourists. He wanted to be free! We have another “Monkey-fish” here at St. Bonaventure University. Thanks for the excellent tale! I love it, I’ve always wanted a feegee mermaid of my own. All pirates should have Feejee mermaid. Barnum’s is lost, perhaps you will find it? I am Monkey Fish. Therefore I am. Fantastic. Thank you. In Australian colonial days it was quite common for similar such beasts to be constructed and sent back to England to delight the common folk. So common it was that, as I understand, the original Platypus sent back the the “mother country” was believed to be a fake! Welcome Monkey Fish, are you perhaps related to Alan and Paul? Interesting that you mention the platypus. You are right, when Europeans first ‘discovered’ the platypus they did not believe IT was real: ‘Is it a mammal?’ ‘No, it’s a fish’ ‘I think it’s a duck’… It took collectors a while to prove that accounts of tortoises were real too, because sailors kept eating them on the voyage home! Who knows how many undocumented, severely endangered species were lost to history due to a single man’s impulsive hunger.. Sadder that my first thought upon seeing the monkey-fish is what it’d taste like fried, buttered with a garnish of lemon. Gosh, who knows how many other species Darwin ate into extinction? I bet he never tasted anything as good as a monkey-fish fried in garlic butter. Thank you for visiting and leaving your excellent comment! Wow, monkey-fish are famous far and wide. That we don’t know so much about them makes it so interesting. Thank you for visiting and leaving your comment! I’ve never heard about the monkey fish before but I must say that the monkey fish has a face that only a mother can love. That is one ugly little thing, just goes to show you combining body parts from other species is bad! This sounds to me like someone’s art project. Wouldn’t they be surprised!!! Thank you for visiting and leaving your comment! Great post. And I would definitely recommend a visit to the Horniman Museum. What a brilliant place to get married. They do aromatherapy and beekeeping there too, I really must visit the Horniman! Gosh! This is brilliant, you found Paul. I like the can-can fairies best. It’s me…I knew I wouldn’t be able to pull it off…please kill me now…as humanely as possible if it’s not too much extra trouble…. That thing is awesome, thanks for the information! You are welcome! Glad you were entertained. Who couldn’t be hooked with a good fish story about a monkey. Under the right condition I would probably pay to see it. If it was a flying monkey-fish I would pay a premium. The whole story is fascinating. Well presented. Thank you for your great comment on my post! Thank you! I am truly amazed by all the great comments. How fabulous. Phew, have to take a break from answering now as I have a wedding to go to – not monkey-fish’s! Oh, my. Thanks for the education! I never heard of them until now! 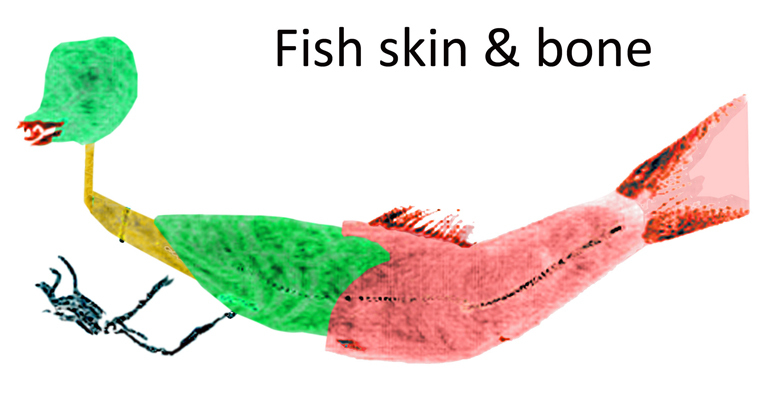 Monkey-fish should be an essential part of curricula for school education! 🙂 Thank you for visiting, I am glad you liked it! Great post…love the images & your thoughts/research. Thanks. Thank you for your kind comment on my post. The thoughts are my own but the images and research are thanks to Paolo Viscardi of the Horniman Museum and also great information from the Wellcome Library. If you are in London, they are great places to visit! it’s a great story. is it true ? Thank you for your comment, Jimmy. The myths and trails of mermaids and mermen are very interesting, glad you liked this one! Barnum would have written a great post on his Feejee mermaid, I imagine…! Brilliant. My word. A monkey fish. Love the monkey fish. hope there is more out there, how cool would that be? Ross MacFarlane of the Wellcome Library gave a really interesting talk at my work that took us on the trail of Henry Wellcome and his ‘mermaids’. This monkey-fish was originally purchased by Henry in 1919 and later went to the Horniman Museum. There are records of more monkey-fish in auction catalogues but not all have been found, including monkey-fish babies. How cool is that? I wonder what they drunk on those ships? Thank you for visiting! Loving the Monkey-fish! Pity that he contains none of the major ingredient, monkey. Can I ask what the teeth are made of, are they wood or clay? Perhaps made out of chicken, the ever elusive ‘hens teeth’! 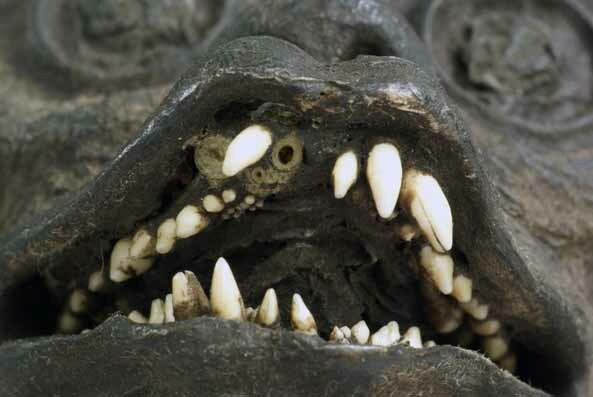 The teeth are made of fish bone, according to Horniman research, and the curators are getting these DNA tested to find out what species of fish was used. Fascinating! Thank you for loving monkey-fish, he is very happy! I blog about old newspaper articles and I can’t resist having a search for a monkey-fish one 🙂 Wish me luck! HA! I did find a 1938 article about a member of his family when he was called the Manchu man-fish, I have posted about it today and included a link to this post. Awesome. I didn’t even really want that sleep tonight anyway. Sorry for making you lose sleep – I didn’t sleep well the first night I saw monkey-fish! Thank you for visiting, that’s awesome! So that’s where Paul is hiding… Thank you for leaving that comment, I just checked out the Manchester Natural History Museum website (http://www.museum.manchester.ac.uk/) and the T-Rex looks very cool! Thank you, monkey-fish is pretty impressive. I love your philosophy on food too! 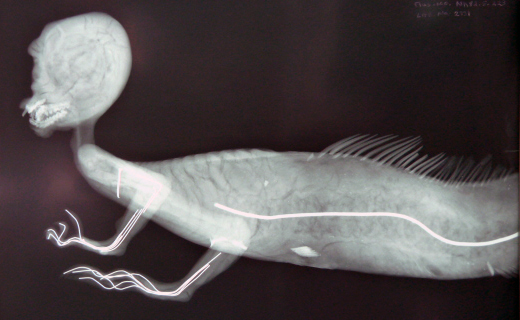 … Well, there are rumours of monkey-fish babies, said the curator of the Horniman Museum. Maybe they are cuter? Maybe I missed something, are they showing it as a genuine animal? Or as a fraud? Good question! Monkey-fish were exhibited in the past as genuine animals by show-men to an incredulous Victorian public. Our exhibition displayed it as an example of a forgery – a fake monkey on a fake fish! I hope that helps clear things up? Thank you for visiting. You were my very first reblog ever. Love stuff like this. Back again soon. Enjoy the weekend. OMG! This looks like something out of a fantastic story. Thanks for sharing! You are right, the stories of mermen and mermaids are fantastic – and people used to believe them. Thank you for visiting, I am happy you enjoyed it! You hear something weird every day…. He’s kinda cute though. Thank you, glad you like him. I did have a nightmare about monkey-fish the first time I saw him – sort of creeping through the corridors – but the little beastie grows on you. If you hear of anything weirder, let me know! While I do appreciate academic findings that further explain where we have come from as a species, I don’t think that this post could have been creepier. It’s a fish. With a monkey head. At the very least, it redefines “surf and turf”. Thank you, I am very happy that you enjoyed it! Thank you to everyone who liked this post about monkey-fish! The little fella couldn’t be more pleased. It has really made his day – and mine! I am now going to make a cup of tea and do my best to answer the great comments. Wow. It is mind blowing to think of all the different species on the planet. Amazing. Thank you for sharing such a story! I am blown away how many people like monkey-fish, that is amazing! Thank you for leaving your comment. I actually thought it was a mummified monkey head, surprised! What’s really interesting about this is the person who made this had no idea his creation would last this long and carry on a joke even longer. Very cool! You were not alone! Captain Eades, a 19th-century American sea captain, sold his ship (that wasn’t even his) to buy the Feejee mermaid (a famous monkey-fish fraud) because he thought it was real (it wasn’t). It is still a mystery who made this monkey-fish and why. I hope Paolo, its curator, can unravel it. Thank you for visiting my blog, I am enjoying reading everyone’s comments! OK. I like monkeys (the stuffed kind) very much. I do a video with one every Monday. Thankfully, he does not have teeth like this creature. My monkey hath not teeth – like chickens have no teeth. My question is this: if there are no monkey parts, then doesn’t the mystery deepen? What the heck kind of man-eating chicken has teeth like that? Huh? Now that would be scary! Let them start breeding…Lord! That would be the end of the McNugget, for sure! The mystery does indeed deepen… These mermen are thought to be over thousands of years old in Japanese Shinto shrines, but only became known in 18th and 19th centuries through trade between Japan and the West. I would love to know how old this monkey-fish is, where he came from originally and who made him. I do hope there are no man-eating chickens with sharp fish teeth roaming about! Thank you for visiting and, um, beware of chickens! I was drawn to this with hopes of a discovery of a new species! lol. I love your elaborate ponderings of wht it could POSSIBLY be! It looks like a shrunken head on a cod. Its clay with wood and bones. No monkeys were harmed in the making of this post – or monkey-fish. disgusting. and fun. kinda like jello, but not as colorful. or as sugarful, yet without the horse parts. Maybe monkey-fish likes jello. I don’t know. But no horse parts! Brilliant! People might be fascinated also by the work of Spanish artist/photographer Joan Fontcuberta, particularly his series called “Fauna”. I just adore the flying elephants. Thank you for visiting and sharing that information! Thank you for the link, it is a great interview. And thanks for following up on my comment, too. These fakes and fantastic creatures seem to evoke a strange kind of nostalgia for something that never existed …….. If you can answer these 3 questions, you will be granted 1 wish. I wish for my own monkey-fish, of course! hahaha! love that monkey fish! tell me does it dance as well? I suspect it may dance and come to life at night – like ‘Night at the Museum’! Feejee mermaids are incredible, and you’ve found a truly scary-looking one. Your exhibit is awesome! Thank you, Ben. Isn’t the story of the Feejee mermaid incredible? This monkey-fish has now left us to return to the Horniman Museum, maybe you can visit him there? You want creepy? The Greater Weever fish sometimes gets a parasite that eats its tongue, then becomes its tongue! Nature-shock! That is truly disturbing… but also awesome, thanks for sharing! This is a hilarious post. There is a monkey fish in Karen Joy Fowler’s book, Sarah Canary, and it’s terrifying. The funniest thing is how much hype this thing seemed to cause. It’s so bizarre that I can’t tell if this is really convincing satirical fiction, or a well told anecdote. Cool story. Thank you, Ben. I am glad you enjoyed it. It was pretty hilarious having a monkey-fish visit my work – that part is true 🙂 You are right, these fake creatures caused a lot of hype among Victorians who loved collecting cabinets of curiosities. ‘Sarah Canary’ sounds like a great book, I will check it out! Thank you, that is great. You have a lot of cool stuff on your blog too! Did you know that woodpeckers can peck 20 times per second? Gosh! As a beekeeper, I am always on the look-out for woodpeckers in winter as they burrow holes into hives to eat bees, larvae, comb and honey. No wonder if they can peck 20 times per second, amazing! Hello. Hardly news, there is a specimen on display in the Enlightenment Gallery at the British Museum. This is a great post and it looks a fine exhibition, but whilst monkey-fish’s head is evidently made of paper, his teeth are surely real teeth? Monkey teeth? Chicken teeth? As I was looking at the Monkeyfish, it occurred to me how it is possible to learn what we don’t understand with compassion . That’s great, thank you! And very true! Monkey-fish is cleverly made indeed! Maybe these ‘mermen’ were an ancient form of art? Thank you for your comment! Interesting post. Funny enough, there is also a monkey fish in Banff, Alberta that has always fascinated me. Although there was no description or write up on the display, it’s just there under glass in one of the stores. Wow, more monkey-fish! I wonder where yours is from and how many more are there? If you find out, I will be interested to know. Thank you for visiting. Awsome! Anything is possible. There’s still a LOT of things to be discovered, both artifacts and mysterious ‘monsters’ roaming the earth. Many places still to be discovered. Many monkey-fish to be unearthed. Indeed, awesome! Its portrait rather unnerves, at first, doesn’t it? I hope you had another gin and tonic! Apparently 19th-century British scholars thought the platypus was faked when a specimen was brought back from Australia. They dissected it, tested it and scrutinised it only to discover that it was real. Nature’s own little joke. That is very true, who wouldn’t think the platypus is a joke? There are many things in nature stranger than monkey-fish. Thank you for visiting and for your interesting comment! Thank you for your comment, I love the paper dress design on your blog, very creative! That’s a shame. Looks like monkey-fish will have to swim to you! Wow. Did not expect such as lovely response to monkey-fish or to be Freshly Pressed. Tickled pink (me, not monkey-fish). A big thank you to all the great WordPress bloggers who liked and commented on this post. And a huge thank you to WordPress for being such a brilliant place to blog with like-minded people! Hahaha, monkey-fish, I love it! What a story too. Shifty post-Victorian English merchants! What’s funny is that people DIDN’T believe in the platypus but they DID believe in the monkey-fish. People are stranger than fiction. You are right, there certainly is interesting phenomena out there! Thank you for visiting and for your comment. If you ever find out, I will be interested to know… Thank you for visiting and your intriguing comment! Pingback: The Manchu Man-Fish. 1938. « Buried words and Bushwa. This would have been a million times better if you just told me that monkey fish was found in an underwater tomb in japan and was indeed half fish, half unidentifiable creature from mythical asia. That is actually true. This story is just a cover up. 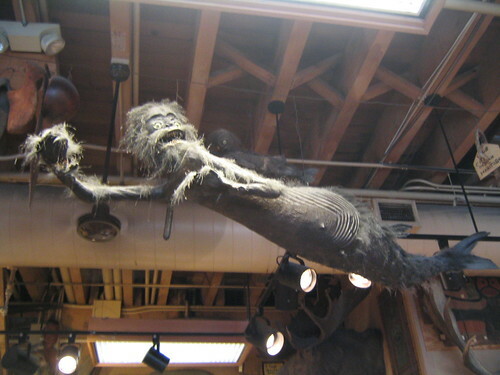 I sincerely just watched an episode of Mysteries at the Museum about the “Fiji Mermaid” yesterday morning. This is so interesting! First spider-pig, now spider-goat, where will it all end? I wonder if there are any spider-people out there? Thanks for the clip, I love Horizons. Thanks for the information ! but is it real ? Yes. Darwin discovered the species in the Galapagos but hid it from the rest of the world fearing they were not ready for the ‘missing link’. What I have just passed off as fact is actually a lie. The paper made me sad too. But monkey-fish proves even papier-mâché can be cool. Actually that looks like a lot of work being made with papier-mâché. You’re welcome, your blog’s really cool. Jeepers! I hope that monkey-fish doesn’t come back to life in 23 years. Harpoon ready. Thank you for sharing! It looks scary. Still so many “creature” in our world. And maybe we still don’t know. Who knows, indeed. I’m happy you enjoyed the post, thank you for visiting! this was an interesting blog to read/see. but it was in fact intreaguing to me because its such a cool creature to think about. When I was a kid we went to the Ripley’s Believe It or Not Museum in – I think it was St. Augustine, Florida. It was a great, big old Victorian building. 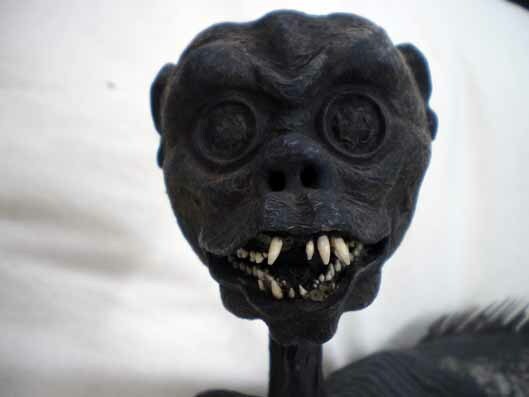 There we saw a “mermaid” – maybe this very same one….but it was a genuine monkey which had been sewn to a fish and was really ancient, allegedly from the latter days of the P. T. Barnum Museum. Gosh! We have a Ripley’s too at Piccadilly Circus, London. I got lost in the maze of mirrors. Ripley’s popularity shows people still want to be incredulous and amazed just like in Barnum’s time! I wonder where the Floridian monkey-fish came from? Reblogged this on Lyconpedia – The Mini encyclopedia. Thoughtful article! The monkey-fist looks really scary. But, I don’t think he wanted to be locked up like this! Thank you for visiting, I am glad you liked reading about monkey-fish! Love the monkey fish! I always wanted to be a mermaid when I grew up, but I can’t even swim! Being a mermaid would be lovely – like Ariel – but I don’t swim either and I have croc-fear. Weird stuff! The head shot is very creepy! Monkey-fish certainly has an unforgettable face! It’s true. Monkey-Fish is high maintenance! Pingback: Captured Merpeople. 1917. « Buried words and Bushwa. There is one in “The Cabinet of Curiosities’ Colledtion in Brighton Museum, and another in Hull…. Ah, so that’s where Monkey-Fish has been hiding!